In case you haven't yet heard about the newest thing that I was totally into before anyone else, you can read the BNAYE rules here. The next time I'm in Toronto, I hope I can catch a show by Dearly Beloved. And if I die before I get there, I hope they'll play my funeral. That's because their US debut, Make It Bleed, is a primer in dealing with the death of a loved one and I figure I'll be OK (well, dead), but the rest of you may need some help. Make It Bleed, which admittedly sounds like an emo album from a band with an emo-ish name is surprisingly full of actual emotion. I was so surprised, I broke down in tears, then played it again. Well, OK, that's not true, but I did play it again, because the sound is somehow a mix of the chaos of a guitar feeding back and the fury of a person in the midst of trashing their apartment because they just found out their dad died. And before Make It Bleed was ever recorded, Rob Higgins, who plays bass, sings, and pens the lyrics, actually did lose his father. I can tell by the words of Make It Bleed that this was incredibly difficult for him. And at the same time, there are numerous references to both the need to genuinely accept what has happened, despite the pressure to pretend things are OK, and the need to move on rather than dwell on the futility of wishing it had never happened. At times, the music, at the furious edge of chaos or the abyss (or both), seems to be on the verge of some kind of sonic suicide, but Dearly Beloved always pull back from that precipice and drive on, or as the lyrics would suggest, move on. Which is exactly like Sisyphus, or at least Sisyphus as the famed French absurdist Albert Camus presented him. Sisyphus, in Camus' The Myth of Sisyphus, is doomed to push a boulder up a mountain for eternity, except when he gets to the top, the boulder always rolls right back down. Camus concludes that despite the meaninglessness of the task, Sisyphus cannot commit suicide, can't take the easy way out, but must create meaning in the task itself. Ultimately, Camus concludes that we must imagine Sisyphus happy. I'm under no illusion that anyone should imagine Rob Higgins happy— only Rob Higgins can decide that. But I think there's a chance he would. The songs on Make It Bleed evoke power in the face of the absurd. The relentless drumbeats, the aggressive bass lines and wild guitar riffs remind us of Sisyphus' climb. And at the same time, the lyrics insist on the authenticity of Higgins' emotions. The world is unfair and meaningless, and attempts to deny this, by suicide or by grinning and bearing it, are simply living in bad faith. Nevertheless, I expect a second release from Dearly Beloved, and I'll buy it when it comes out, because I want to see where this is headed. Of course, if they dwell on the death of Rob Higgins' father, it will seem like they haven't moved on. And if they forget it entirely, they'll seem to have given up. I hope for all our sakes they take a different approach. I realize that I'm basically asking Rob Higgins to always remember the pain of his father dying, which is really sort of a horrible thing to ask a person to do. But anyway, music reviews aren't supposed to be about feelings, unless that feeling is having your ever-loving mind blown by the intensity of rock and roll. 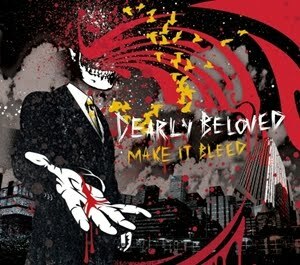 Conveniently, Dearly Beloved's Make It Bleed gives me exactly that feeling.